It was a showbiz arrival: colored lights gently dimmed, 1950s doo-wop music thrumming softly, a tub of warm water in the delivery room of a Honolulu hospital. Peter Gene Hernandez IV, later to be known as Bruno Mars, floated in the water for twenty minutes before his umbilical cord was cut. “We wanted to be sure he entered the world peacefully—and musically,” writes Bruno’s father, Peter Hernandez III, in his memoir-in-progress, From Brooklyn to Mars: The Rise of Bruno Mars. Hernandez, a third-generation musician, and his former wife, the late Bernadette Bayot Hernandez, a vocalist and hula dancer, orchestrated the details of their son’s birth in the hope that maybe, just maybe, their musical lineage might be imprinted on their infant son. On the opening spread: Bruno Mars performs before a crowd of more than eighty thousand in the 2014 Super Bowl halftime show at New Jersey’s MetLife Stadium. 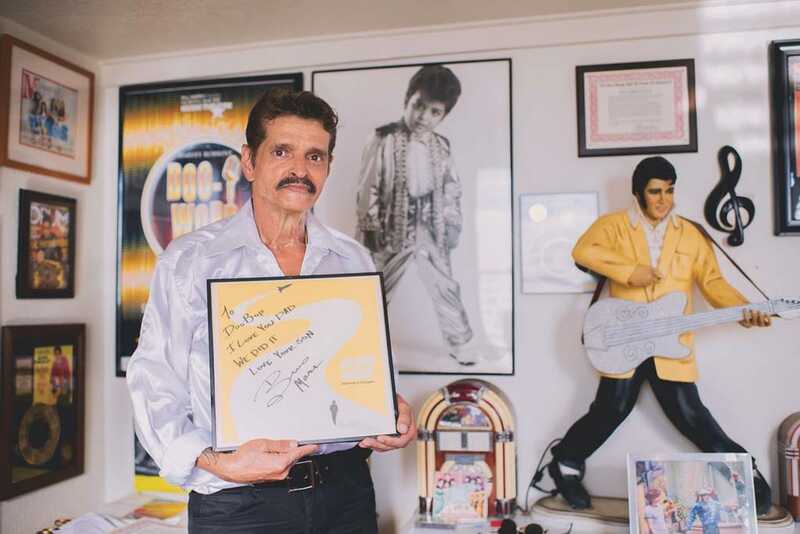 Peter Hernandez III, Bruno Mars’ father and an accomplished musician himself, lives in a Kaimukī studio filled with memorabilia of his son and Elvis Presley. It’s hard to say, but who needs proof? Thirty-two years later the “round, tough-looking baby,” as his father described him, has shed his tough-guy persona for a polished sensuality and musical virtuosity that have driven him to the top of the charts. A veteran of the sought-after Super Bowl halftime performances and a staple at the Grammys and on Billboard charts, Bruno took home the BET (Black Entertainment Television, which includes other minorities) awards for Best Male R&B/Pop Artist and Video of the Year awards last June. 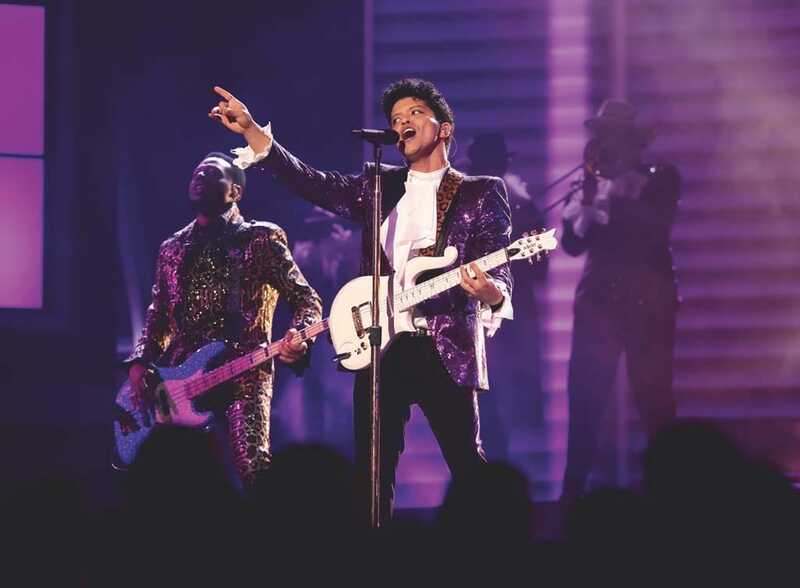 In last February’s Grammys, with fans still mourning the loss of Prince, it was Bruno Mars who, eerily Prince-like in a moving tribute, channeled the “Purple Rain” god with a white guitar, purple sequined jacket and white ruffled shirt. On his current three-year world tour, every gig—at the headlong pace of a different venue every day or two—brings sold-out arenas, oceans of ink and enough energy to power a city. I asked Bruno what he loved most about the work. Writing? Performing? Producing? Touring? He pointed to his love of per-forming and of his fans. “I love meeting my fans from all over the world,” he responded. “Otherwise they would just be Instagrams and people on social media who send wonderful comments. On tour they become real.” The most difficult part of his current tour (in support of his recent album, 24K Magic), he added, was “dealing with the sadness that flowed from the tragedy at the Ariana Grande concert,” the suicide bombing in England’s Manchester Arena. The event roiled the world and hit fellow entertainers hard. “I can’t believe that people can be so cruel,” Bruno told me. Maui businesswoman Debbie De Mello has attended Bruno Mars concerts in Seattle and Hawai‘i (twice), and she has booked seats for September’s Madison Square Garden show in New York. She also saw Bruno in his teenage years in Honolulu, when he impersonated Michael Jackson in Waikīkī. But from the fourteenth row of one of Mars’ 2014 Blaisdell shows, De Mello experienced, again, the magic of who he had become. The slick moves, the flawless vocals, the tight instrumentals, the choreography—he does it all, including the songwriting. “We didn’t sit down the whole time,” De Mello continued.“Everyone in front of me was standing, too. Everyone wanted to dance; with Bruno Mars you just can’t sit still.” She was as star-struck by Peter Hernandez and the Love Notes as she was by his superstar son. Without doubt, there’s music in the Hernandez DNA. In his memoir, Hernandez describes how Bruno’s great-grandfather played guitar in the clubs and cabarets of Puerto Rico, while his grandfather, a successful musician in New York, opened for a number of Latin greats, including mambo king Tito Puente. Hernandez III grew up in Brooklyn, where doo-wop, with its vocal harmonies and simple beat, was sung on street corners. Never far from music, Hernandez got his first drums at age seven and began honing his musical chops. In 1977, Presley’s film Blue Hawaii lured the elder Hernandez to Hawai‘i, where he opened the Elvis Elvis Elvis museum and costumed his young son as “the world’s youngest Elvis impersonator.” At left: Baby Bruno—Peter Hernandez IV— was a naturally charismatic and polished performer at three years old. Bruno stole the show with his first act as Elvis and was immediately dubbed “the world’s youngest Elvis.” He mastered the Elvis sneer, gyrated on Waikīkī stages in a tight sequined jacket and bell-bottoms and wore his curly hair perfectly coiffed into a signature pompadour. He was cheeky and fearless, and his dimples had a fan club all their own. I remember seeing him, his ensemble aglow with a belt buckle half the size of his torso, crooning in his little-boy voice, his movements and attitude pure Elvis. He was loose-limbed and confident as he slithered and glided across the stage, timing perfect, holding the mic in the nonchalant Elvis way. Like the Bruno Mars of today, he owned the stage, and the crowd roared its approval as the King of Rock came to life. Bruno’s fan base may be international, but in Hawai‘i it’s also personal. Lori Hamel, who has taught for twenty-five years at Bruno’s alma mater, Roosevelt High School, is not surprised at his success. He spent his four high school years at Roosevelt and left for Los Angeles immediately after graduating in 2003. There was no fear or equivocation, she recalls; he knew what he wanted and went after it. “I had him in my junior English class, my drama class and my newswriting class,” Hamel recalled. “He was Peter then and I still call him Peter. When he left I knew he would pursue his dream. He was focused on moving to LA and making a career in music. That’s exactly what he did. From his regalia to his peerless sneer, hip gyrations and nonchalance, Bruno was an unflappable Elvis impersonator on Waikīkī stages; the adult Bruno sings, writes, choreographs, performs and plays multiple instruments, including guitar and drums. “He came back one time. He had gotten a contract with Motown, and we were so excited for him, but then nothing happened for a while.” When he returned in 2010 for his first concert in Hawai‘i, said Hamel, he again paid a visit to the school. Because Hamel was on Christmas break and missed him, Bruno had left a note for her with a video clip of him saying hello to her. From childhood through graduation, Bruno worked with his family in the evenings, either with the Love Notes or in the Legends show in Waikīkī. “That was a lot for him,” Hamel continues. “School early in the morning and the show running late at night.” He still managed to write a monthly column for the school newsletter, Peter’s Playground, that included original poems and essays. Bruno accepts the award for Best Pop Vocal Album for his 2012 record Unorthodox Jukebox — his second Grammy—at the fifty-sixth Grammy Awards in January 2014. Bruno dedicated the award to his mother, Bernadette Bayot, who passed away in 2013. “Ma, I know you’re watching, and I hope you’re smiling,” he said. “We’d laugh and say, ‘Hey, the poems —maybe he’s starting to write lyrics,’” Hamel says. “He was always very talented with words and in drama. The school plays, especially, highlighted his sense of humor and acting ability. He also sang.” Most of the Roosevelt students knew him for his dancing and choreography, which gained visibility in the boys pep squad for homecoming, she adds. “The pep squad was always phenomenal, and for the boys who signed up, Peter was a taskmaster. You had to be serious, you had to show up for rehearsal.” He had a band called the Schoolboys, and he was also in a Polynesian music class. His schoolwork, his evening performances in Waikīkī, making it to class on time—it was all a big load for a student. Bruno has reached the highest echelons for an American musician, with Super Bowl performances, Grammy and BET awards, and too many magazine covers to count. Above, Bruno and his band, the Hooligans, in full force at his second Super Bowl halftime performance in February 2016. Bruno Mars is doing exactly what he set out to do at 17 years old, but even his father is incredulous at the level of success his son has achieved. Where to go from the top? Bruno says that he will “continue to try and stay ahead of the curve and maintain the highest level of entertainment and a deeper involvement in the needs of family and humanity.” Professionally, say father and son, it’s hoped that movies will also be on the superstar’s horizon. His epic dance moves, peerless vocals and range, kinetic energy and creativity suggest that in some ways he is just getting started. As for acting ability, his guest appearances on SNL prove his gift for comedy and acting, and his lifelong impersonations—Elvis, Michael Jackson, Jackie Wilson—speak volumes about his acting chops.